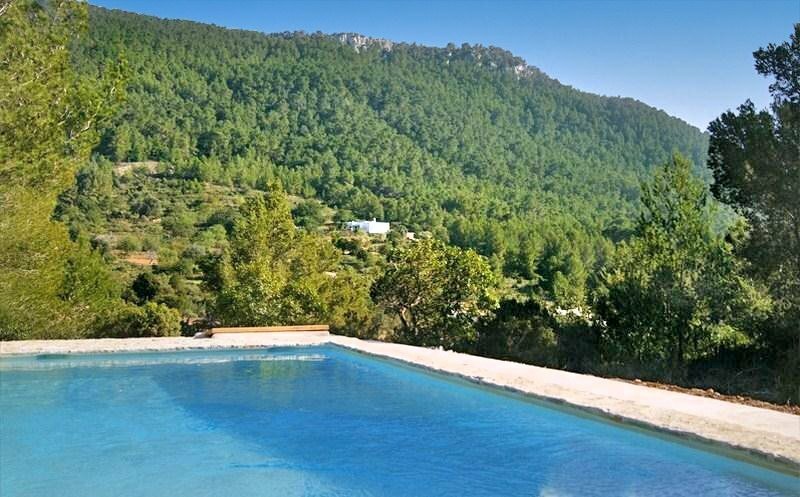 Nestled in a genuinely natural, tranquil location, high in the hills of Cala Vadella, Villa Willow is the ideal home for a group looking to relax in the famous Ibiza sun in a private environment. Oozing style and sophistication, this is a modern, luxurious villa that combines the best of the typical Ibizan style with a contemporary design and facilities, all less than 3km away from the glistening Mediterranean Sea! Inside you will find a beautiful living area, with a soft sofa in front of the satellite TV and fireplace, alongside a kitchen and dining area, separated only by a tastefully traditional archway. The kitchen demonstrates a charming, rustic style blended perfectly with a more contemporary design and all the latest mod cons, including a coffee machine, blender and a large American style fridge/freezer. A central island, which doubles as a breakfast bar, provides plenty of space for meal prep. There are three stylish bedrooms, each with a private bathroom and rustic charm. Each delightful bedroom is adorned with beautiful reminders of the beaches nearby, with all kinds of aquatic-themed artwork on the walls. On the first floor, there is a double bedroom which enjoys a private balcony which enjoys a coffee table and seats and utterly majestic views of the natural landscape. The fabulous garden makes the most of this unique location in the vibrant forest of the west of the island, with plenty of sun loungers and space for relaxing in the tranquil nature, including a hammock! The huge pool is as rustic and traditional as it is glamorous, lined by palm trees and sun loungers, and built into the terrace, looking out to the perfectly rural surroundings. On the terrace, there is an alfresco dining area, shaded under the beautiful veranda, as well as a comfortable seating area near to the pool. The nearby beaches of Cala Vadella, Cala D 'Hort, Cala Moli, Cala Tarida or Cala Comte are stunning, with crystal clear waters, soft sand and small bays to explore, and what's more – you can access them in under 5 minutes, perfect for a morning stroll to start the day. This villa is within minutes of just about everything you could need, including some of the world's best beach clubs! The vibrant towns of San Antoni and Ibiza are about equidistant from the villa, both within around 15km, putting the full spectrum of delightful activities of the island at your fingertips. Just a five-minute drive from the beautiful coastline of Western Ibiza and the sublime Balearic Sea, Villa Willow is ideally placed to enjoy all the real highlights of an Ibizan holiday! From water sports to a simple beach day out, the coastline offers so much to enjoy throughout the day, not to mention the world-famous club nights hosted in the beach bars, your most local of which, the fabulous Can Jaume bar, is just a half hour, downhill walk away!